At 80, Claire McClelland isn’t particularly keen on video games, but she loves bowling, which she had to give up decades ago because of arthritis. Now the Norfolk woman is not only back in the game but behind the controls of a pastime the younger generation is wild about: Nintendo Wii. The game is a video console system that flew off the shelves when it was released last year. Players hold the game controls and go through the swinging motion of bowling, golfing, playing tennis and even boxing. An animated figure on a screen carries through the motion. It’s geared toward the younger set as pure fun, but recently the senior generation began taking a crack at it at Lake Taylor Transitional Care Hospital with a different goal in mind: rehabilitation. 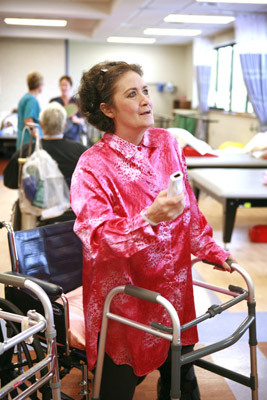 McClelland, who is recovering from a fractured hip, winced a bit last week as she rose from a wheelchair for some Wii bowling. She struggled to put a thumb bent by arthritis on a computer control button. Then she pulled her arm back behind her, swung it forward again and released the button to let go of the ball. The wide-eyed computer figure on the big-screen TV threw the ball right down the alley. McClelland’s grimace turned to a smile as the pins fell. Jan Whitus, who directs rehabilitation at the Norfolk long-term-care facility, was playing the game with her children this summer when it occurred to her the arm and body motions would be perfect for rehabilitation. The swinging of the arms could help stroke victims improve their range of motion. Managing the remote-control panel could hone the fine-motor skills of arthritis patients. Standing to swing the control panel could help joint-replacement patients regain balance. And it had another benefit for patients struggling through the pain of rehab: fun. “Rehabilitation is hard, and it’s painful. This takes the focus off that,” Whitus said. The traditional grunt work of rehab- leg lifts and stationary biking and arm stretches- would continue, but the Wii game was thrown in as a bonus a few weeks ago. 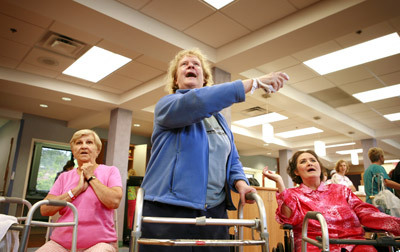 McClelland played the game with another patient, 65-year-old Joyce Welsh, who is recovering from knee surgery. Each sat in wheelchairs and stood to take their turns with the support of Michael Hayes, an occupational therapist assistant at Lake Taylor. “Pshaw,” McClelland said when her bowling ball headed toward the gutter. Soon, though, she got the hang of it and was scoring strikes and spares. Welsh of Virginia Beach wanted to take a swing at the golf game, which has been the most popular sport here. She hit one ball into the sand trap, but the next one bounced onto the green. 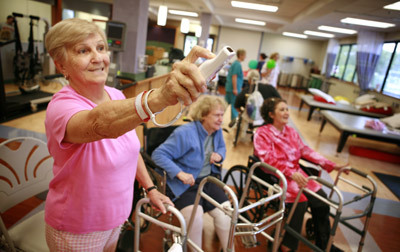 Lake Taylor is not the only facility using Nintendo Wii consoles, which cost about $250. 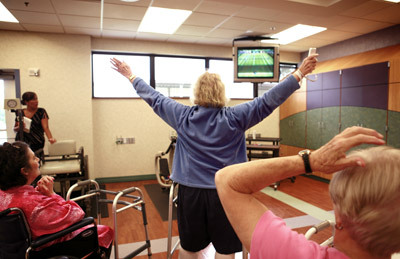 Other hospitals- including on in Raleigh, N.C., and another in Alberta, Canada- use the game system in their rehab departments. A retirement center in the Chicago area recently had a Wii bowling tournament to keep residents active, alert and entertained. The Nintendo company has not professed any health benefits to the game but did reveal in July it’s developing a game console called WiiFit designed to help people of all ages exercise. Expected to be released in the U.S. next year, it comes with a “balance board” people stand on for aerobics, dance and exercises. In McClelland’s opinion, however, bowling is more fun, which seems to be the selling point for the folks at Lake Taylor.